Q: Where’s the best ice cream in the whole world? A: In the tiny town of Hartford, Wisconsin. Q: Where’s the strangest ice cream in the whole world? 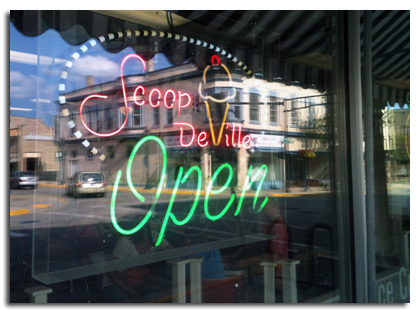 Scoop DeVille is an old fashioned ice cream parlor that makes the best ice cream in all your favorite flavors, and a bunch of other flavors too, most that you would never even dream of. You have to try them to believe them. And they’re all good. How are these for fun flavors? They have all the classics too. But if you’re adventurous, they happily let you sample whatever flavors you want to try. My daughter tried Fat Elvis the last time. She liked the peanut butter ice cream flavor, but didn’t like the chunks of banana. Then she tried Salted Caramel, which is now her all-time favorite. I tried Tiramisu, which was really good, and Chai, which was even better. But my all-time favorite is Mocha Bean. The ice cream is dark chocolate crossed with coffee, and it has chopped up bits of chocolate-covered espresso beans mixed in. I may never sleep again, but it is totally worth it. So when you’re when you’re wondering where to get ice cream that tastes like bacon, or you’re hungry for the best ice cream in the world, you might plan a visit to Scoop DeVille, in downtown Hartford, Wisconsin. 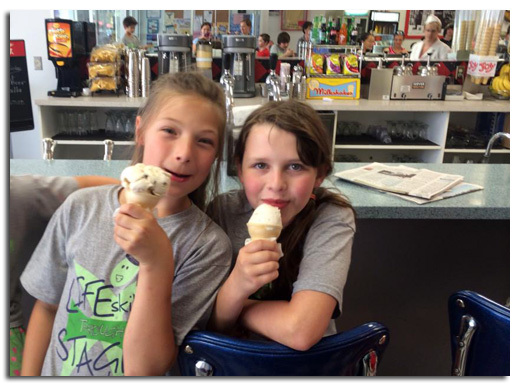 Or do you know a place with even better ice cream? Where do you and your family like to go? Leave me a comment and tell me your favorite ice cream spot, and I will happily check it out.